Macaroons make us swoon. We just love them. And we made them even better by subbing honey for sugar, which gives sweetness without overpowering the delicate almond coconut flavor, and the aromatic vanilla. Since macaroons only use egg whites – make sure to use up the extra egg yolk by throwing into a delicious fritatta or adding to a soup! In a large bowl, whisk together the honey and the egg whites. Then add the almonds, shredded coconut, and vanilla, and mix together well. 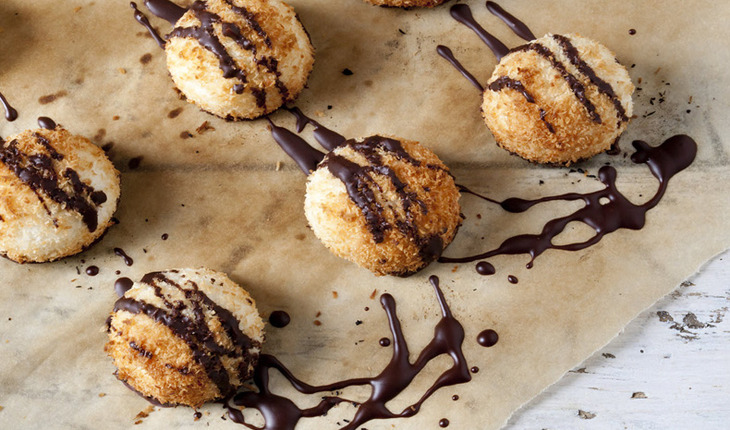 Form the dough into individual macaroons. Drop each cookie onto the parchment paper, then place in the oven. Bake the macaroons until the bottoms are golden brown, about 12 minutes. Let cool for a few minutes, then enjoy!